If you told anyone within a footy-club culture, even 10 years ago, that one day there’d be a women’s AFL league, you probably would have been laugh-sprayed with VB and ushered out of the room. If you’d said the competition would not only take centre stage on the sporting calendar but also be a lockout – well, who knows what the reaction would have been. Televised on prime time TV? Tell ’em they’re dreamin’. But that’s what happened when history was made at Ikon Park on Friday night. Any debate over whether the women would be as entertaining as the men was quickly forgotten as the players showed passion, grit, stamina and a level of skill that may have surprised some football fans. Naturally, it lacked some of the high-octane properties of the men’s competition, but as its own brand, there’s excitement aplenty. 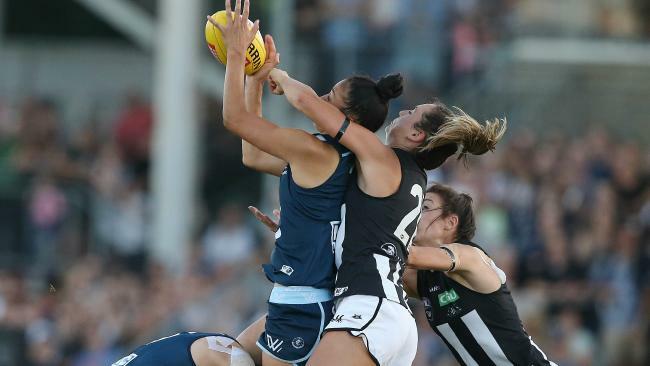 Yes, there’ll always be naysayers who won’t budge from what they know – the AFL is quite enough, thank you very much – but women’s prime time footy looks like it’s here to stay. Which, as a father of three girls, can only be a good thing. When I found out my third – and most definitely final – child was to be female, I’d resigned myself to a life of gymnastics and netball watching, with more ‘gender-neutral’ sports like athletics on the radar, should they wish to try them out. Girls’ footy was certainly a thing, but it lacked profile; it wasn’t on the TV or in online advertising and very few of their friends would be playing it. One heady Friday night and things have changed, maybe forever. Perhaps now, I’d see one – or all! – of my children grace the footy field! I won’t dust off the Sherrin just yet but over the coming weeks, I’ll encourage my girls to tune into the games. I’ll explain that these girls have never been afraid to go against the grain; that they love what they do; and that they should always do the same. If they want to become the next Sharelle McMahon or Lauren Mitchell, that’s great. So, too, should they wish to emulate Daisy Pearce or Darcy Vescio. The Trump-era and the rise and rise of the fame-chasing Kardashians continues to bring uncertainty and mixed messages about what it takes to be admired. But with girls all over Australia set to be inundated with a new batch of role models, I suddenly feel a little more at ease with how my girls might see the world.